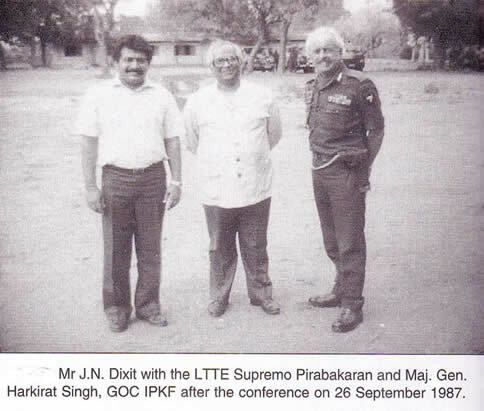 From left: Prabhakaran, Dixit and General Harkirat Singh. Ten days after this picture was taken, they will be fighting a war against each other. At first, Major General Harkirat Singh had it easy. In July 1987, he had been sent to Sri Lanka to command Indian Army’s 54 Infantry Division, essentially making him in-charge of the IPKF in the Tamil North. At first this had meant protecting Tamils from the Sri Lankan army and cajoling LTTE and other Tamil insurgent groups into keeping their side of the Accord. The duties were mostly ceremonial and the biggest worry for officers was to have enough games and activities going to make sure that the soldiers don’t grow bored. Meanwhile, IPKF command was making friends with the Tamil insurgents. LTTE leadership was often in and out of IPKF HQ. Indian officers attended weddings of LTTE families. General Singh hoped to be back home by December. All in all, it seemed an easy assignment. Sadly, the good days were not to last. Behind IPKF’s backs, LTTE had been steadily preparing for a war with the IPKF. Weapons were being smuggled in and hoarded; anti-India propaganda was quietly being circulated. LTTE was also assassinating rival Tamil leaders, getting rid of the competition from other Tamil insurgent groups. Parallel to it, Prabhakaran was slowly sabotaging the negotiations, making excessive demands from the Sri Lankan government. India’s High Commissioner in Colombo, JN Dixit, who had been taking care of the political side of the Accord, was the first raise alarm. But General Singh and IPKF command, sympathetic to LTTE, were willing to give it the benefit of the doubt.